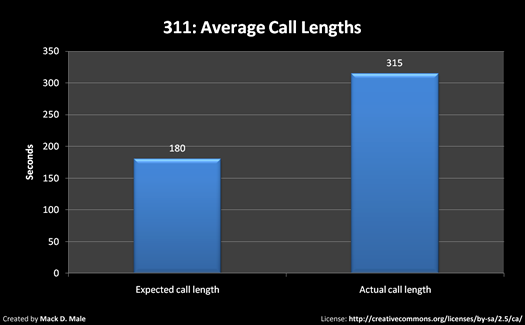 As you’ve probably heard by now, the City’s 311 service is not performing as well as expected. The Sun first reported the story last week, and the Journal followed up with an article yesterday. They key point mentioned in both is that wait times to connect to an operator are far longer than originally anticipated. As a result, an interactive voice response system is being considered for next year. 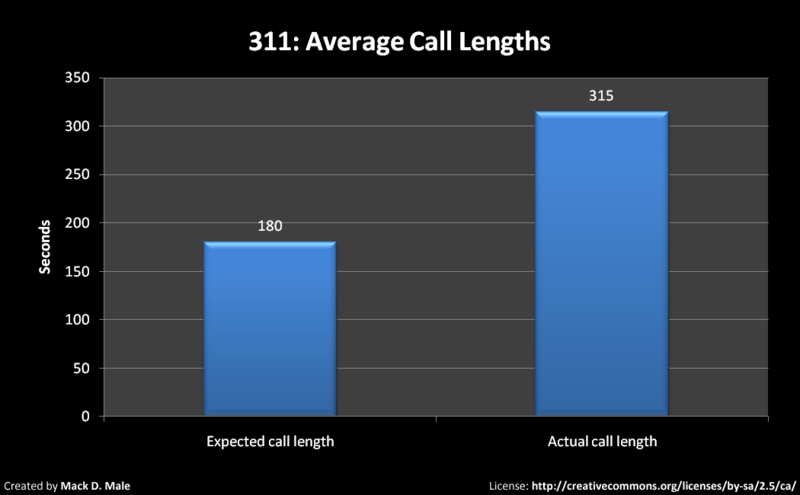 I can’t imagine that will make callers any happier, even if it does make their calls slightly faster. I personally think they should put more resources into 311 online. How many citizens even realize that they get online access to a lot of the information and services that 311 provides? The best way to reduce call times is to increase self-service options and quality so that citizens can bypass the phone altogether. Fortunately, there are new self-service features being developed for release in October. The City will still need to communicate their existence effectively, however. The CRTC approved the use of the 311 phone number for municipal services back in November 2004, and Calgary became the first city to launch 311 on May 8, 2005. Here in Edmonton, City Council approved the service at its May 9, 2006 meeting. Edmonton became the first city in North America to use SAP’s CRM application to deliver 311. The 311 service officially launched on December 16, 2008. Implementation was approved at a cost not to exceed $10 million (and it is on track to come in about $1.5 million under budget). Half of that amount came from an internal loan, which is to be repaid from operating savings (the other half came from a special dividend in 2005). The report that went to the Executive Committee this week isn’t incredibly long at 7 pages, but it does have lots of information. Here are some graphics to help make it easier to understand the first six months of 311 operation in Edmonton. 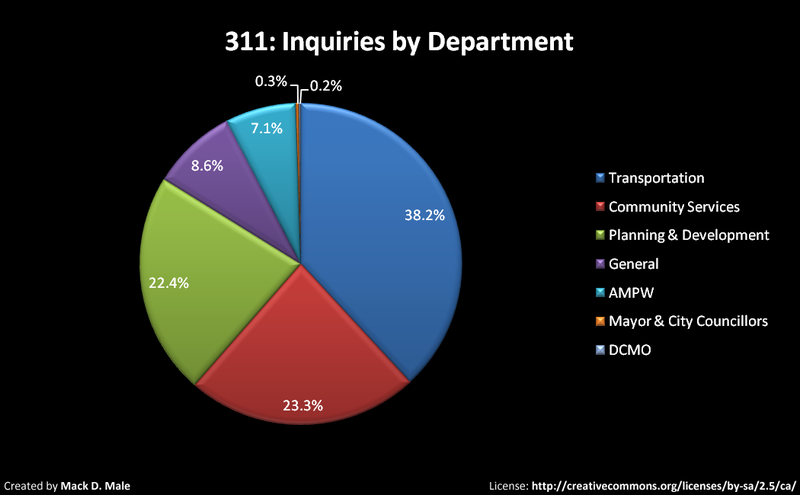 Transit inquiries make up a significant portion of all 311 calls, followed by Community Services inquiries. 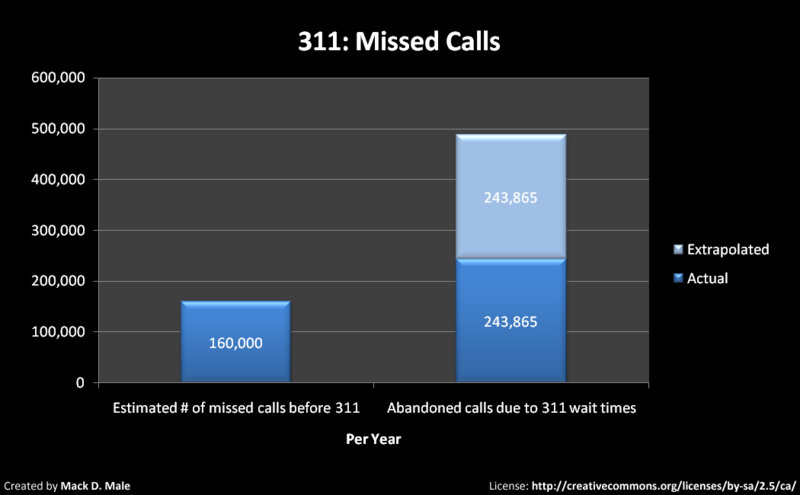 There’s a clear opportunity for transit to do more to reduce the number of calls going through 311. I find it odd that trip planning is such a common request actually, given that there’s a separate number for that (BusLink) not to mention the online trip planner and Google Maps. There are a few more graphs (without data values unfortunately) in the report, so take a look at those too. 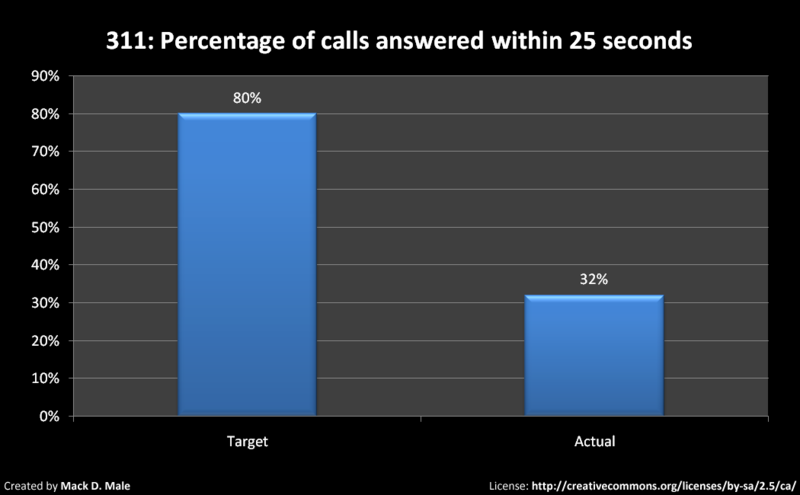 They show that the number of calls answered within 25 seconds is on the rise, and that the time it takes to get through to someone is declining. Does this report suggest that 311 is “a disaster”? I don’t think so. All it shows is that there is work to do, and it sounds like the 311 team is on the case. Hopefully the departments they serve are as well.